In the UK, every year, around 19,000 cyclists are killed or injured in road accidents. We have already seen innovative safety wearables such as the Skull Cap and Hovding looking to reduce this figure — acting as alternative headgear that could encourage more riders to protect themselves. Now, multinational car manufacturer Volvo is doing its bit too, with Volvo LifePaint — a highly reflective temporary spray which is invisible in the daytime but becomes illuminous at night, by reflecting the light from headlights. 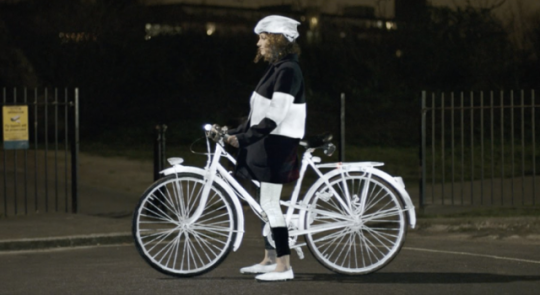 Volvo LifePaint can be sprayed onto bikes, clothing and bags to help make cyclists much more visible in the dark. The particles in the paint can not be seen in the daytime but glow brightly under headlights, illuminating the bike and rider. The paint lasts for about a week, can be washed off anytime and will not have any lasting effect on the surface material. It is currently available in bike shops around London. Volvo previously launched the Volvo V40, which includes an external airbag to help protect pedestrians in the event of a collision. The Swedish company are committed to helping create safer roads and protecting those both inside and outside of their cars. How else could car companies innovate to improve road safety?